Two North East businesswomen have transformed a former farm building within the Whitehouse Farm Centre in Northumberland into a new nursery. Lindsey Oliver and Laura Graham have completed the renovation of the disused building at the Whitehouse Farm Centre in Morpeth, Northumberland, to provide nursery provision for up to 48 children. The completion of the project supported by the corporate and property teams at Ward Hadaway is the culmination of the parental vision to create a safe, nurturing, home-from-home environment that encourages learning for youngsters between the ages of six weeks and five years old. It was during a chance conversation between good friends Lindsey and Laura that the idea of combining their years of early childcare experience and running a business was born. The co-owners of the Nursery at Whitehouse Farm loved the idea of being their own bosses, having juggled work and looking after children themselves in the past. Laura, who is mum to five-year-old Isabelle, took a leap of faith in the new nursery venture having been working in marketing for a large company in the region. She said: “We had a vision when we saw the building and knew with some TLC it could be transformed into an amazing place for families and children. Its location is perfect as it is situated within the Whitehouse Farm Centre itself, which is an amazing place to spend a day with children. With frequent access into the farm and acres of land to explore, our ability to learn and enjoy the great outdoors are endless. “A friend recommended we speak to James Nightingale at Ward Hadaway [in Newcastle] about setting up our business because of the firm’s expertise and knowledge of the nursery sector. For Lindsey, a mum to five-year-old twin girls, Maisie and Yasmin, it was a step motivated by a passion for early childcare that spurred her on to get involved in the new venture. She added: “Our over-riding philosophy is that nursery provision is not just about the children. It’s also about the parents who tend to put themselves last. So while the children are safe and nurtured which adds to their development, we also know parents need to find time for themselves in their busy schedule and so we are providing them with grab-and-go breakfasts and teas. The pair’s attention-to-detail is reflected in the building’s design with its stylish décor. The spacious nursery includes a baby room, toddler’s room, pre-school room, kitchen area and outdoor area. There’s also a magical forest area and Whitehouse Farm on the doorstep too. 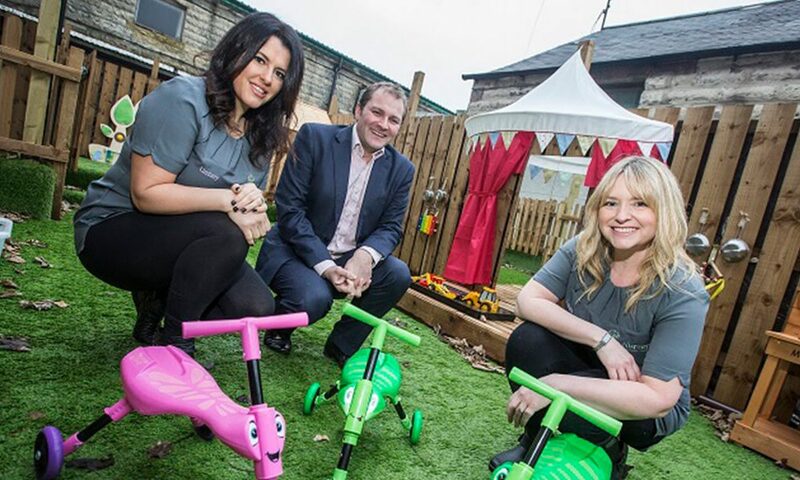 James Nightingale, a Partner in the Corporate team at Top 100 law firm Ward Hadaway, said: “We were delighted to help Lindsey and Laura during this exciting time in establishing the new nursery. “The sector is one which we know well having acted historically for a number of clients, including advising on the sale of market-leading provider Kids 1st to the UK’s largest nursery provider, Busy Bees.